The Q2 is one of the most used lines in the Metrobus system with 10,200 passengers a day. They are looking for ways to improve service and will be having a public meeting on Thursday, February 5 at the Holiday Park Senior Center, 3905 Ferrara Drive, Silver Spring, MD. The open house will begin at 6:30 pm, followed by a presentation at 7:00 pm. They also are conducting a ridership survey. They did it on the bus on Dec 17, but you can fill it out online too. If you ride the Q2 go fill it out. When I was younger I rode the Q2 every day. It took a long time and traffic was slow, but it was faster (and much cheaper) than taking the red line from Shady Grove to Silver Spring. I looked at the comments people wrote on the survey and it looks like things are worse than when I rode it. Overcrowded to the point that the bus drivers can't always pick up passengers, no buses for a while then two or three right in a row, still only rarely have the extra long buses. Maryland has joined Virginia in providing a searchable database of inspection reports from daycare and other child-care centers across the state. Child-care providers in Maryland have mixed opinions about the new system, with some raising questions about accuracy and limitations. Each online report gives yes-or-no indicators of problems in 50 broad areas of regulation. But no details are included, so it can be difficult to assess a problem's severity. Parents seeking more information must phone or write licensing officials. The state's new system was developed at virtually no cost because it was built with software the state already uses to help parents locate child care. I'm really glad it didn't cost much because the site is a usability disaster. I went there to look up a daycare I used in the past. On loading, instead of giving me a search box it gave an error message "Search timed out" Reloading gave me the query form. I did the search and couldn't find the next link, it is small and non-obvious. The search results are in no particular order, not by inspection date, provider, address (I searched on City and type of provider so those were all the same). When I finally found the daycare I was looking for it was a chore to pull up the full report. the instructions (when was the last time you needed instructions to figure out how to pull up the full record from a search, could you imagine if Google were like that) said: Click on the number to the left of the record, and then click "View this record" at the bottom to see the details of the inspection. So I clicked on the number, the screen flashed, some text momentarily appeared in the upper left then disappeared. I clicked a number of times to see if the text would stay or if there was a link at the bottom of that bit of text before I realized that at the bottom of the page, nowhere near the record, the link, or the ephemeral text was a "View this Record" link which gives the report. Looking at the report was more bad news. under "License - General Requirements" my daycare had "No". In fact, it had no for all of them. There is no way they were that bad so it was back up to the top to figure out what No meant. Turns out, Instead of a standard chart where Yes means you pass, in this case, Yes means you fail (Yes means you were "out of compliance"). So, in reality, my daycare had passed everything and got very positive "No" ratings. How about making Yes be positive like everywhere else, or better yet, put the word "Pass" if they pass and "Fail" if they fail. It's only a couple of extra letters and it removes ambiguity. Bethesda Theatre may soon cut ticket prices for Wednesday and Thursday shows (but not weekend shows) and has cut some parts of its budget. Imagination Stage canceled a few productions and although they haven't layed anyone off it is possible they will. Their ticket sales have been stable but have had other funding sources reduced. Ticket sales have also been steady at Round House Theater but they are trying to cut 15% from their budget and have layed off three people. I have been curious how Bethesda, MD manages to support three different theaters(Imagination stage is geared towards kids, so really only two), I wonder how much of their viability is dependent on grants/state funding/corporate donations and how much if it is from ticket sales. Have you gone to the theater in the past year? A day after Obama publicly teased local school officials for canceling classes because of wintry weather, he and his wife visited their younger daughter's school on Thursday. Yup, they drove up here to Bethesda, MD and went to Sidwell Friends. Ironically, they drove this morning, when the roads are clear, not yesterday when they were icy. I was walking through Bethesda on Friday night and saw that Conte's Bicycles and Coaching was having a grand opening celebration. They originally planned to open in December of last year but the were off a month or so. Now they are open for real. 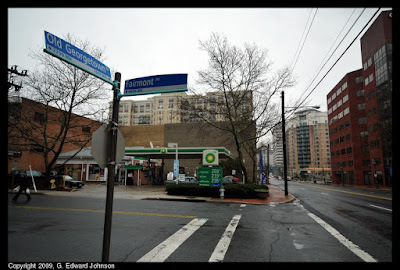 They are located at the corner of Old Georgetown Road and Woodmont Avenue. In the ground level of The Metropolitan apartments where Rosenblum & Associates LLC used to be. The website hasn't been updated with the store hours or phone number yet. This is the first halfway decent snow we have had in Bethesda this year. I was getting tired of the tease-flurries. 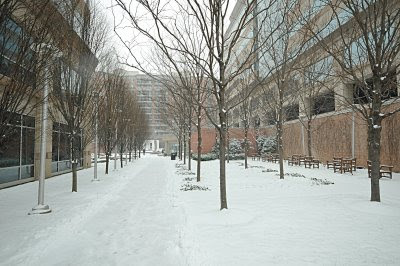 We've had snow all morning and it is still coming down, here is a picture of Bethesda Place Plaza. Unfortunately, it won't be winter bliss, there is a chance it will mix with sleet this afternoon and we'll get 1 to 2 inches of snow plus another 1 to 2 inches of sleet. Tomorrow it really goes down hill. Freezing rain and rain then anything on the ground freezing overnight. I'm planning on working from home tomorrow to avoid the inevitable traffic mess. Not sure about Thursday, maybe I'll go in late if conditions warrant. Check the Bethesda, Maryland forecast. Bethesda is well known for both the quality and quantity of it's restaurants. This week celebrates that. From January 26th thru February 1st you can get a fixed-price two course lunch (either $12 or $15) or three course dinner ($25 or $30) at one of 30 Bethesda-Chevy Chase restaurants. the full list of participating restuarants is available, please call ahead for restrictions and reservations. Ten days ago there was a building here. 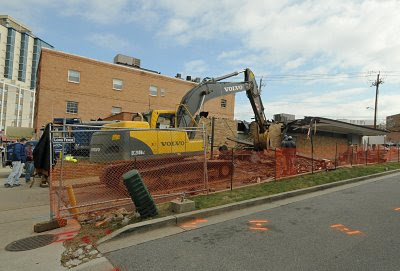 In fact, a prior blog post had a picture of the bank demolition. 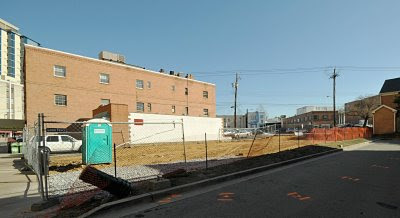 Now this lot on Cordell Avenue is just bare dirt. Lets see how soon they put something new here. 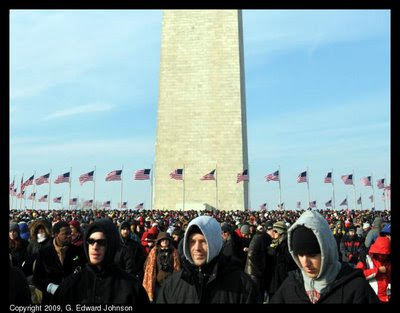 I went down to Barack Obama's inauguration. 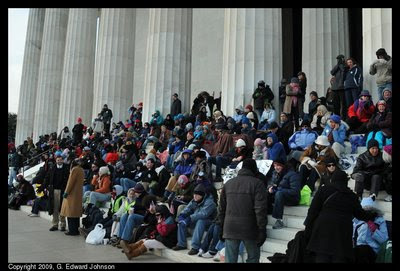 I figured if people were coming in from all over the country to see it, I could make a 10 mile trip. I got to Bethesda Metro Station around 8am and got the first train that came. I was on the last car and it was crowded. The next couple of stations we picked up a few more people until we were really packed in. While on the train I talked to a group of three people who had driven in from Detroit. One of them (Tommy) was a database administrator for a non-profit there. 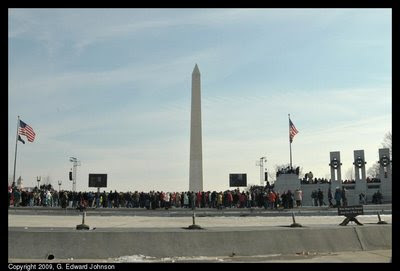 I got off at Faraguet North and walked to the National Mall with them before saying goodbye and heading off on my own. The walk to the mall was interesting in and of itself. 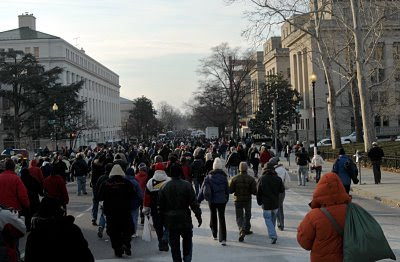 the closer we got, the more people were walking and it was a sea of people from curb to curb, totally filling the street as far as you could see in either direction, all of us heading down to the mall. The FBI is, of course, doing some work to keep us safe at the inauguration. They even have a press release about it with some pictures of the equipment they are bringing. Mostly bomb related stuff, bomb unit, bomb holder, bomb resistant vehicles. One thing I found odd though was that they are bringing their "Mobile Command Center" even though their main headquarters is on the parade route. 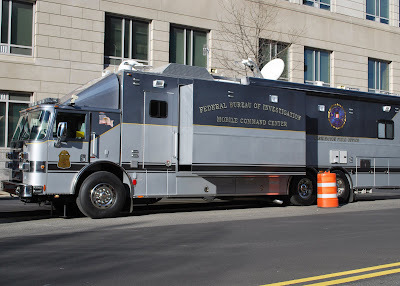 Why do they need a mobile command center when they have one a hundred times larger only a block away? Not often you hear about UFO sightings in Bethesda, MD, but there was one last August, right over Walter Johnson H.S. To think I missed it, maybe next time. I exited the beltway onto Old Georgetown Rd. and turned right on Rock Spring Dr. which leads into the Office Park. It was shortly before 6 pm in August so still light out. On the left side is a High School (I'm not sure of the name - maybe Thomas Johnson H.S.?) Anyway; suspended above the school was an airplane just "hanging" in the air! This isn't the first UFO the person who reported it has seen. I've never seen one so either I am less observant or my UFO repellent is working. 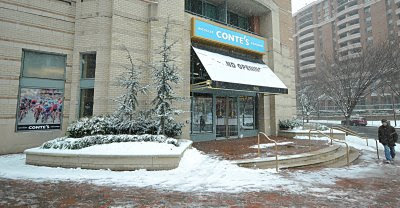 We have a some really cold days coming up here in Bethesda, with high temperatures below freezing for the next 4 days. On Friday, the high will be below 20 degrees! For this area, that is really cold. I pulled out my heavy coat this morning and will be wearing it for the rest of the week (probably everywhere, inside and out) Check the forecast. When I left for work it was 7 degrees. This was up from the low, which was 3.5 so the temperature doubled in just a few hours. If it keeps on doubling every few hours we will have a warm afternoon. The Maryland General Assembly had a good ides. They said "Let's screw everybody who isn't paying attention and willing to jump through hoops". Of course, they didn't phrase it that way, but that is the net result of their action. You see, most homeowners in Maryland are eligible for a "homestead tax credit" which limits the amount your property tax assessment can increase in a year if you actually live there. They think that people who don't live in their homes (i.e. rent them out) are getting the tax credit and shouldn't be. They further say (on their FAQ) that "The only way to verify residency of the homeowner is to require an application and have the filer provide his or her Social Security number." Too bad all that really verifies is you took the time to fill out the form, not that you live there. They could just check your MVA and state tax records and automatically give it to you if both match the property address, but no, that would make sense. Most people get their property taxes taken out of their mortgage escrow account, they never directly pay the bill so, many people never look at their property tax assesment. If you don't look at it, you don't see the form, you get hit with the full increase. Worse yet, you can't just fill out the form now and get it out of the way. You have to wait until they mail you the form, sometime between 2008 and 2010. Good luck remembering that for the next couple of years. They do actually have an online version of the form, (using internet explorer is recommended) but you need the 8-digit security access number that comes on the printed form. I noticed that they are tearing down this bank building today. It is near Woodmont Avenue, the entrance was on Cordell. When I went by they had pulled a heavy beam down and were cutting it with a torch. It is a small building so demolition should go quickly. I have this little project going where I take pictures to track how Bethesda changes. I haven't been doing it for long so mostly it is of construction sites since they change faster. I now have a couple of pictures that were taken exactly one year apart, it is interesting to see what changes you can find. I've made a list, but perhaps I missed some. Most of these changes are pretty subtle, after all, its only been a year. I tried to take the picture from roughly the same spot, but I used a different lens so I didn't attempt to make the picture exactly the same. The most obvious change is the difference in the weather, but that doesn't really count. Lionsgate condo's in the background have been finished and now have people living in them. Gas prices have gone down by $1.20. 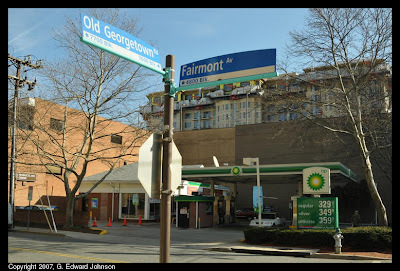 Bethesda in general has high gas prices and this year this gas station is higher than the ones around it (Last year the Shell down the street was usually higher). Below the prices, the sign used to say "Amoco Fuels", now it says something diferent (vpower? I can't quite read it). It also looks like they have the authorized inspection station" sign to the left of the gas price sign. The banners hanging up are a bit different, but that is pretty much a given. I had to pull up the full sized pictures to see this, but on the left side both grounding wires running from the utility pole used to have a cover, now on the inside one, the yellow cover is missing. There are also some things that stand out as being the same. 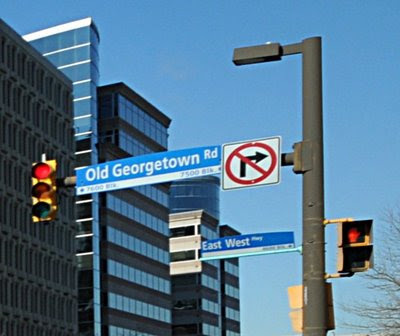 The Old Georgetown Road sign is still a bit bent. Using brick sure does look nice, it gives more texture than plain concrete. There are, however, a few downsides. Take, for example, this picture of Bethesda Metro Plaza. You can see that the bricks aren't totally even, you can also see that they are sightly lower than the drain (in the middle of the picture). Probably they have settled unevenly a bit after being laid. 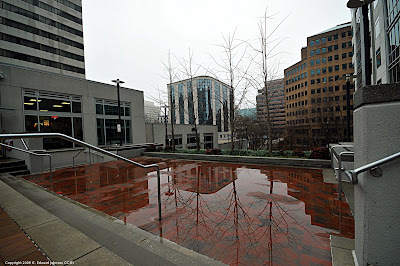 Not even noticeable when it is dry, but when it rains it makes the whole area one big puddle.